My father grew up in Edmonton and my mother in the Peace River area. Initially my father taught industrial arts in Edmonton and my mother was a registered nurse at the old Edmonton General Hospital. When they got married, they initially lived in Edmonton. However, they soon bought a quarter section of land in the Pigeon Lake area (about 45 mins south of Edmonton) and began raising beef cattle in addition to their regular jobs. Once I came along, my mother left nursing to become a full time homemaker. A few years later, my father gave up teaching and together my parents became small business owners, opening a soup & sandwich restaurant in Wetaskiwin. They definitely had their hands full running the business and the farm at the same time. They operated the restaurant for 28 years. In the years that followed they eased into retirement by selling the cattle, and then piece by piece the farm. They are now fully retired. 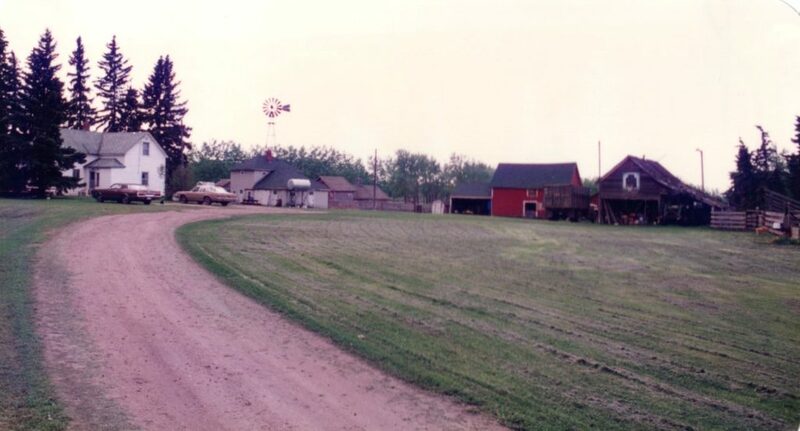 The farm where I grew up. We raised beef cattle so there was never a shortage of work to be done. I am the oldest of 4 boys, which made growing up in a three bedroom, one bathroom farmhouse close quarters at the best of times. The tight accommodations were offset by the benefit of the extra hands when it came time for chores. I attended rural schools, Falun Elementary to start with and then Pigeon Lake Regional for junior high and high school. Growing up, I was involved in minor hockey, fastball, 4-H, Air Cadets, volleyball, basketball, and track and field.